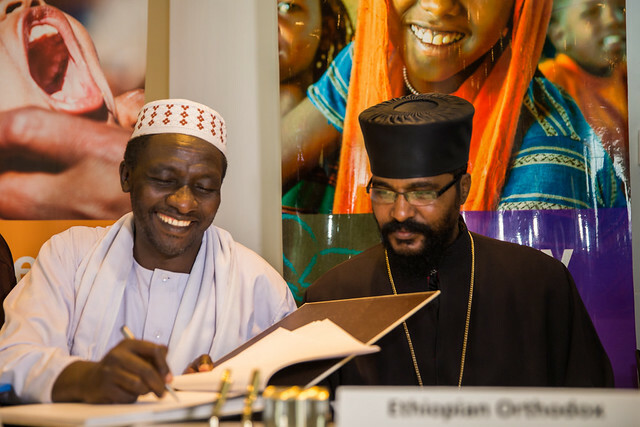 Addis Ababa, 2 August 2016 – Ethiopia’s Leaders of major religious institutions signed Memorandum of Understanding (MoU) with UNICEF marking their joint commitment for sustained promotion of the rights and wellbeing of children, adolescents and women through strategic behaviour and social change interventions. Fourteen signatories signed the MoU, including five major religious denominations along with their respective development offices and four umbrella institutions. Religion is at the heart of people’s value and identity and religious leaders enormously influence moral values and socialization of children in all aspects of life. Religious institutions reach out to vulnerable and disadvantaged children and families, through their inherent values of humanity and extensive structure reaching up to the family and individual levels. Evidence shows that if investments are made to build capacity and engage religious institutions, they can create major impact for behaviour and social norm change. For example, in the Somali region, religious leaders massively contributed to stop the 2013 polio outbreak, by informing and encouraging their communities to regularly immunize their children. 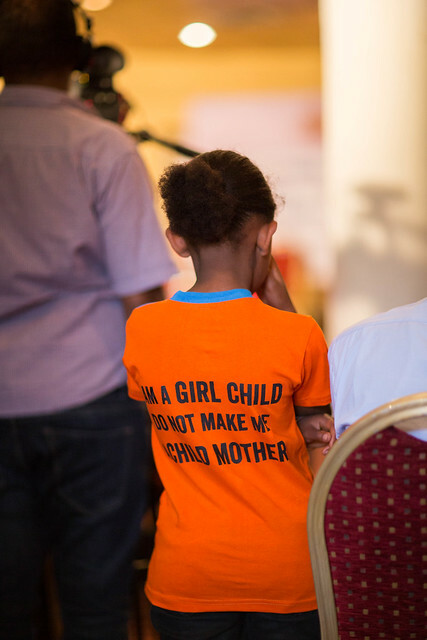 Religious institutions declaring against harmful traditional practices and their active engagement has a huge impact in accelerating Ethiopia’s commitment towards eliminating the female genital mutilation/cutting and child marriage by 2025. 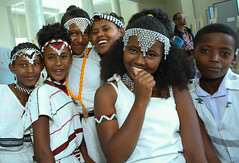 In Amhara region, for example when priests teach against child marriage, when they refuse to bless such unions, communities are receptive and young girls are given the opportunity to pursue their education and their dreams. In their statements, all the signatory religious leaders avowed their commitment to what they called ‘Historic Consensus’ and outlined their respective faith values that create favourable grounds to promote the rights and wellbeing of children and women. Dr. Abba Hailemariam Melese, the Deputy General Manager of the Ethiopian Orthodox Tewahdo Church Patriarchate remarked “…towards this cause the Ethiopian Orthodox Tewahdo Church is ready to engage over half a million clergies and religious fathers with the joint leadership of our spiritual and development wings.” Similarly, Haji Al – Fadil Ali Mustafa, General Secretary of the Ethiopian Islamic Affairs Supreme Council remarked that developmental partners have become wiser by involving and engaging religious organizations and leaders to work for a common goal. In addition to the five major religious denominations of Ethiopian Orthodox Tewahedo Church (EOTC), Ethiopian Islamic Affairs Supreme Council (EIASC) Ethiopian Catholic Church (ECC), Ethiopian Evangelical Church Mekane Yesus (EECMY) and Ethiopian Kale Hiwot Church (EKHC) and their respective development wings, four umbrella institutions including; Inter-Religious Council of Ethiopia (IRCE),Ethiopian Interfaith Forum for Development Dialogue and Action (EIFDDA),Evangelical Churches Fellowship of Ethiopia (ECFE), and Consortium of Evangelical Churches of Ethiopia Development Association (CECEDA) forwarded a statement affirming their commitment. 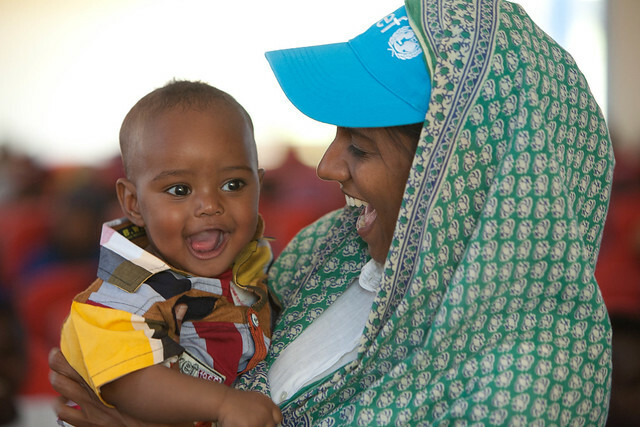 UNICEF was created in 1946, and began its operation in Ethiopia in 1952. UNICEF Ethiopia’s Country Office is located within the UN-Economic Commission for Africa compound in the capital city, Addis Ababa. 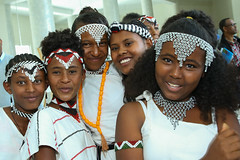 The Country Office is supported by zonal offices present in Assosa, Bahirdar, Dollo Ado, Gambella, Gode, Hawassa, Jijjiga, Kabri Dahar, Mekelle, Oromia and Semera.UNICEF Ethiopia employs approximately 400 highly-qualified and experienced staff, both international and national professionals. 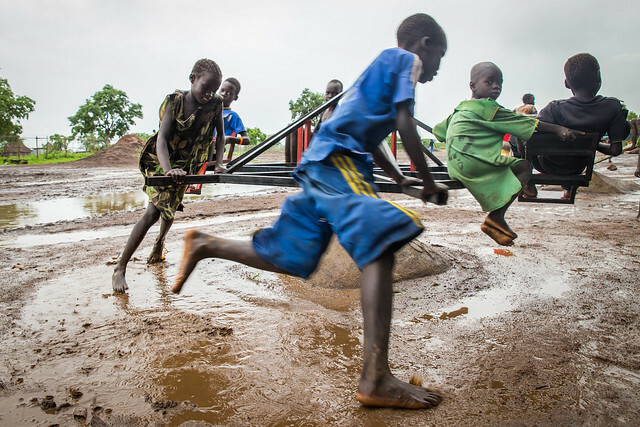 The purpose of UNICEF’s work is to support the realisation of the rights of every child, especially the most disadvantaged children – victims of war, disasters, extreme poverty, all forms of violence and exploitation. UNICEF is uniquely positioned to perform this role, given its comparative advantages. These include: an explicit mandate based on the widely ratified Convention on the Rights of the Child; proven capacity in multiple sectors; a strong field presence; and a mandate that embraces both long-term development and humanitarian response. A key principle underpinning UNICEF’s work is equity, whereby all children have an opportunity to survive, develop and reach their full potential, without discrimination, bias or favouritism. A child growing up in Gambella Region, for example, should have the same opportunities to receive a quality education and access health and protection services as a child growing up in Addis Ababa. There is increasing evidence that a focus on the most disadvantaged and excluded children, families and communities not only accelerates progress towards fulfilment of the rights of all children and reduces disparities but also brings about social and economic growth. In all of its work, UNICEF takes a life-cycle based approach to child development, which recognises key stages in a child’s life as it grows into adulthood, and designs and implements holistic and integrated approaches to health, education and social protection that are appropriate to each of the key life stages. Important results to which UNICEF Ethiopia, in cooperation with other partners, has contributed include: achievement in reducing under-five mortality by two thirds between 1990 and 2012- the required reduction for meeting the target of Millennium Development Goal 4 (MDG 4)-three years ahead of schedule; meeting MDG 7c by halving the number of people without access to safe water since 1990 – 57 per cent of the population now using safe drinking water; a reduction in neonatal mortality from 37 deaths per 1,000 live births in 2010 to 27 deaths per 1,000 live births in 2014;a reduction in the proportion of stunted children from 58 per cent in 2000 to 40 per cent in 2014; adoption of the National Social Protection Policy and a commitment by the Government of Ethiopia to end Harmful Traditional Practices by 2025 and establishment of Vital Events Registration structures at national level. 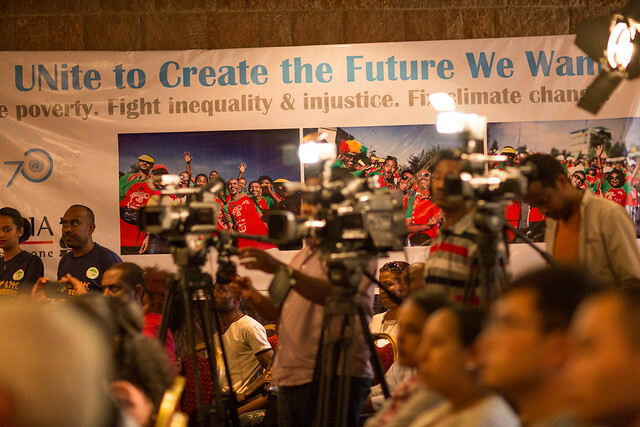 Through the Growth and Transformation plan of the Government of Ethiopia, UNICEF as part of the United Nations Country Team will contribute to four pillars of the United Nations Development Assistance Framework (UNDAF): a) the Resilient, Sustainable, and Green Economy, b) Basic Social Services, c) Governance, Participation and Capacity Development and d) Equality and Empowerment, with the goal of supporting the second Growth and Transformation Plan to progressively realize children’s rights within the framework of the Convention on the Rights of the Child and other international commitments. 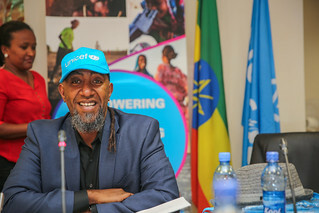 14 October, 2015, Addis Ababa: Today, UNICEF appointed Thomas Gobena (commonly known as Tommy T) as its National Ambassador to Ethiopia at a signing ceremony held in its premises. 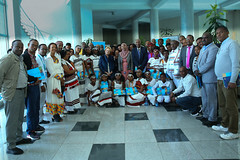 The ceremony was attended by Ms. Patrizia DiGiovanni, Officer in Charge, UNICEF Ethiopia, members of the media and UNICEF staff. A U.S. Citizen with Ethiopian descent, Tommy moved to Washington D.C. at the age of sixteen, and is a bassist for Gogol Bordello- a Gypsy punk band – since 2006. 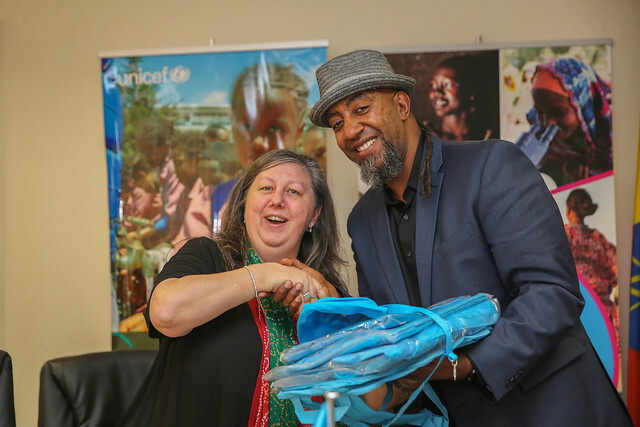 Tommy T. has been an advocate for UNICEF’s work since 2014 and is keen on empowering youth. Thus, he has participated in a Public Service Announcement (PSA) on HIV/AIDS awareness entitled “your life; your decision” produced by UNICEF in collaboration with the Federal Ministry of Health and UNAIDS, which has been appreciated by the public. Tommy has visited several youth and sport for development programmes in Addis, Oromia and SNNP regions and has encouraged young people to peruse their dreams. 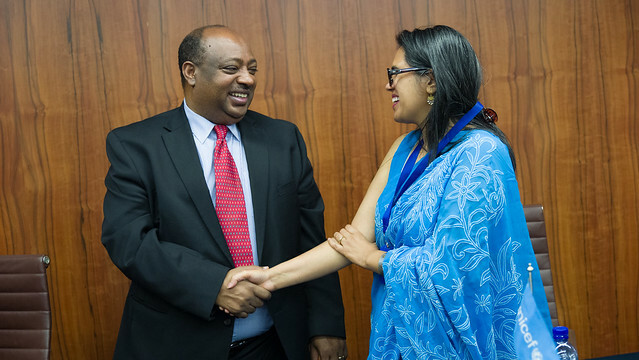 Recently, he had the opportunity to visit a water well drilling UNICEF-supported programme in Dobi kebele (sub-district), 84 km North from Samara in the Afar Region and interacted with beneficiaries. Currently, Tommy is setting up an entertainment company in Ethiopia and is keen to engage further with the public using music to get positive messaging across to the general population in Ethiopia and abroad. 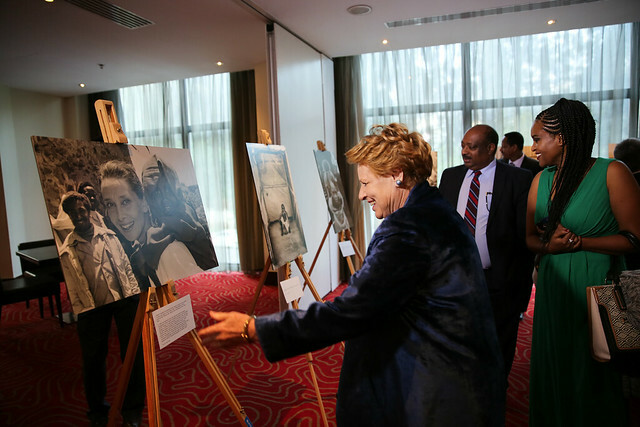 Tommy is following in the footsteps of Aster Awoke, Abelone Melesse and Hannah Godefa as UNICEF National Ambassadors by demonstrating an outstanding commitment and dedication in promoting the rights of women and children’s issues over time.